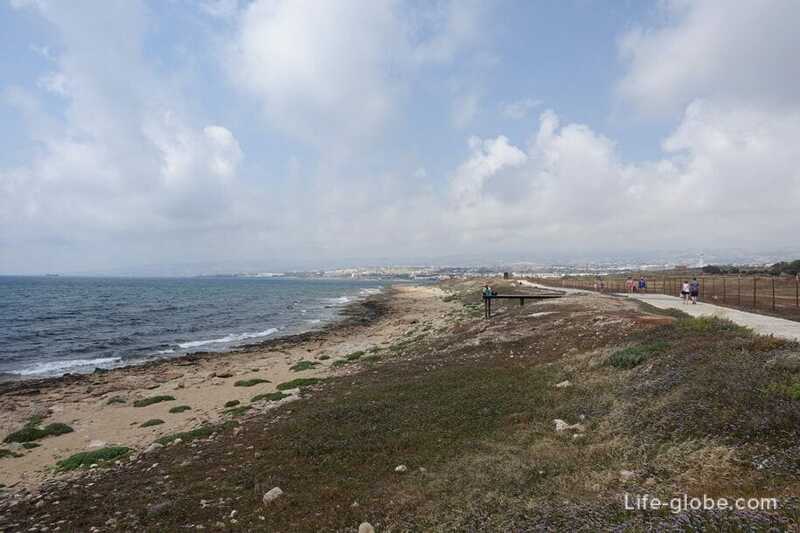 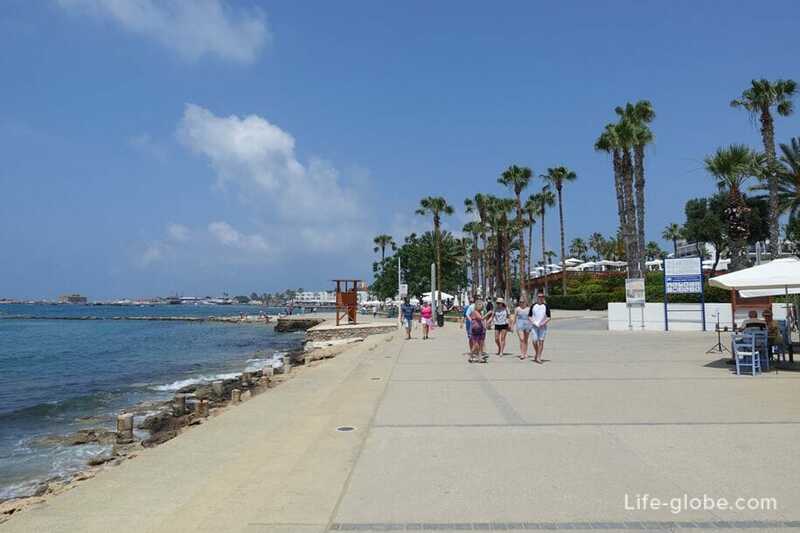 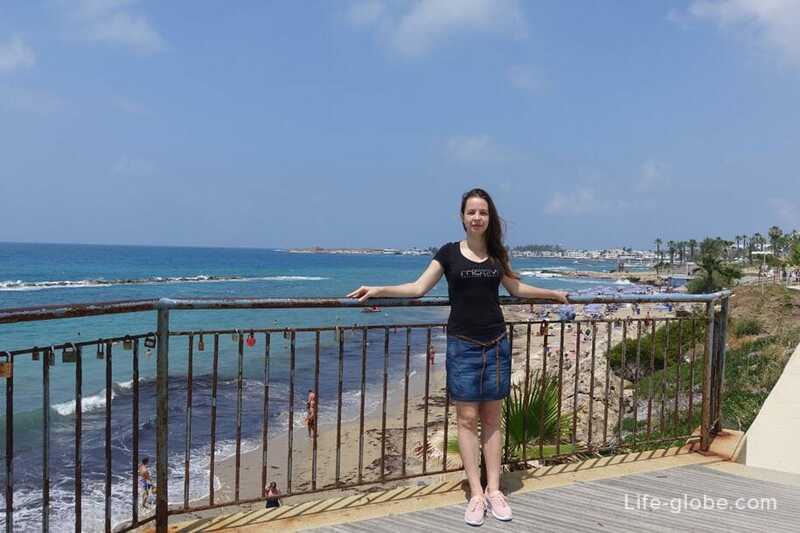 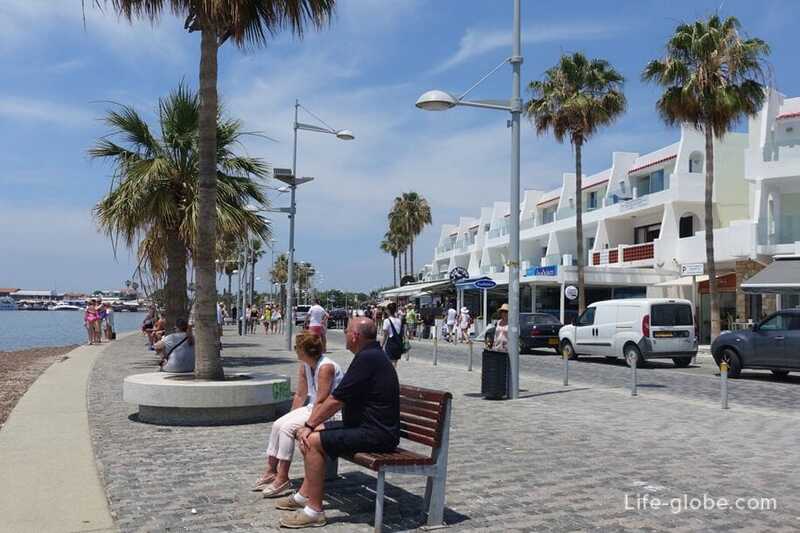 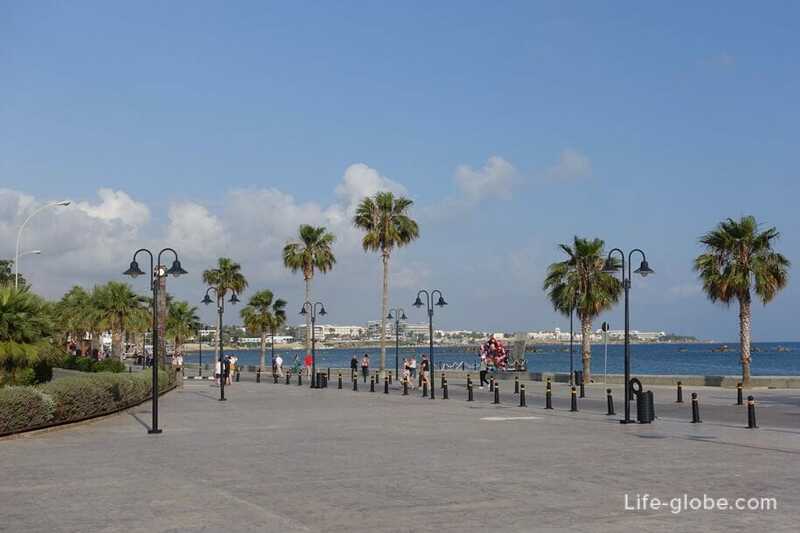 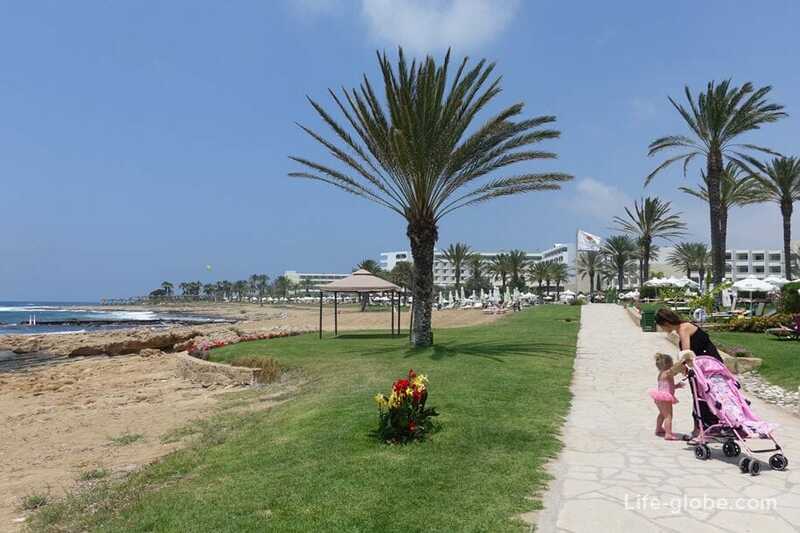 The seafront of Paphos is one of the most popular and beautiful locations in Paphos for walking and recreation. 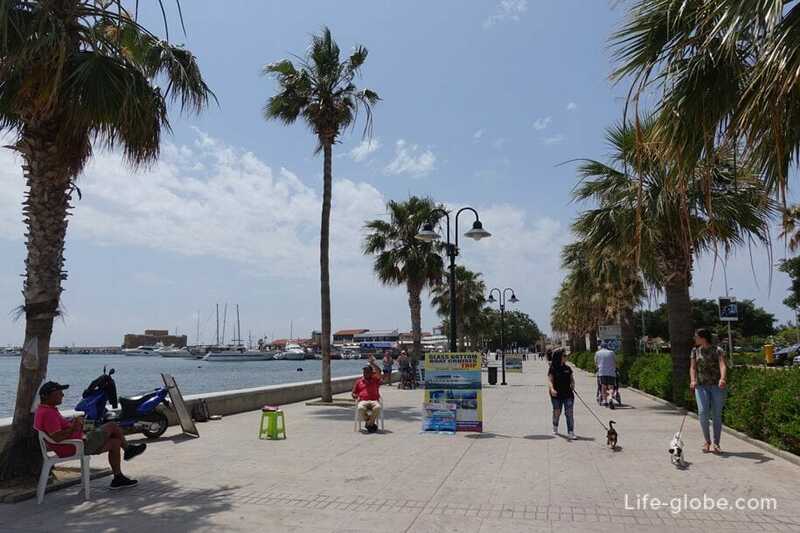 Promenade in the old part of Paphos, in the district of the lower town, known as Kato Paphos. 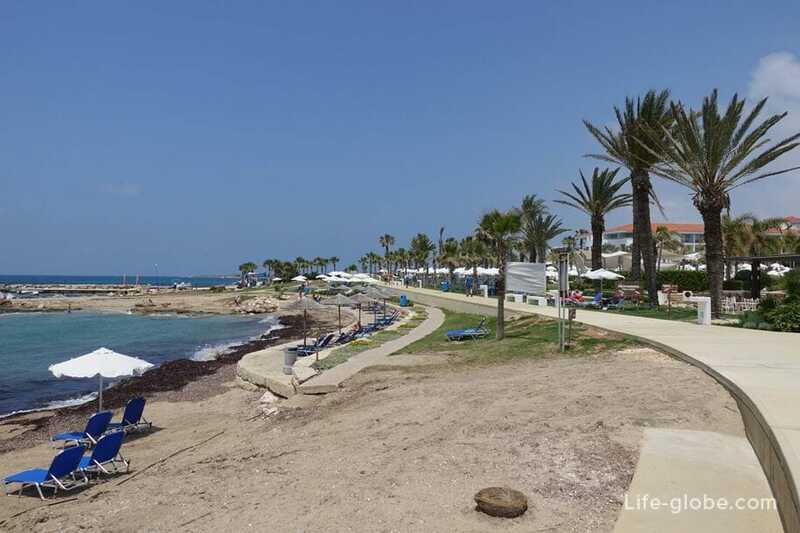 Embankment Paphos (promenade Paphos) runs along the coast of Kato Paphos and beyond, along the coast of the tourist area of Yeroskipou, which is a continuation of Paphos. 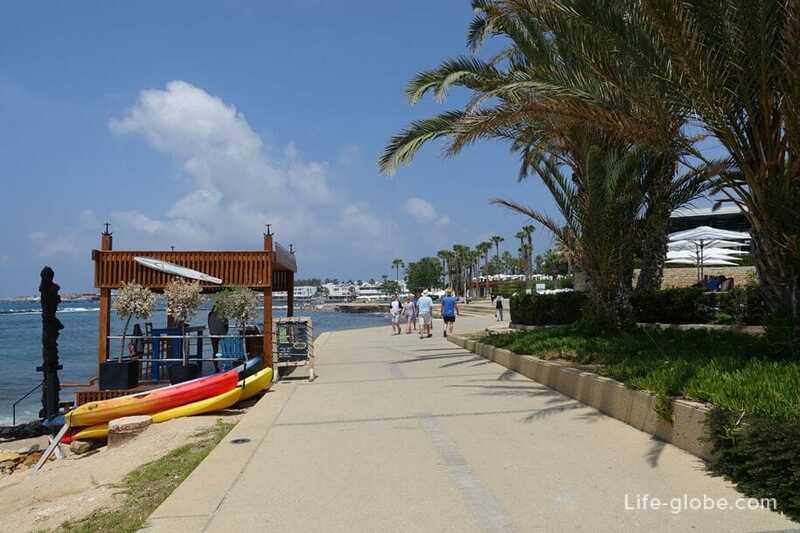 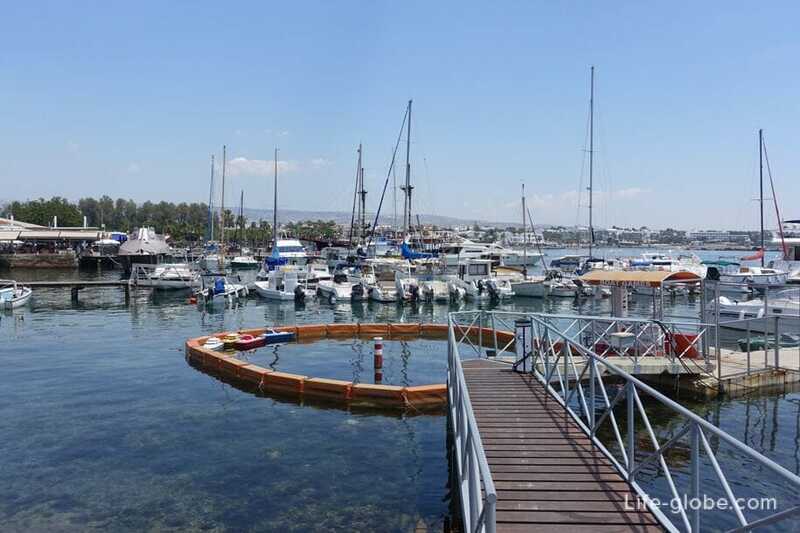 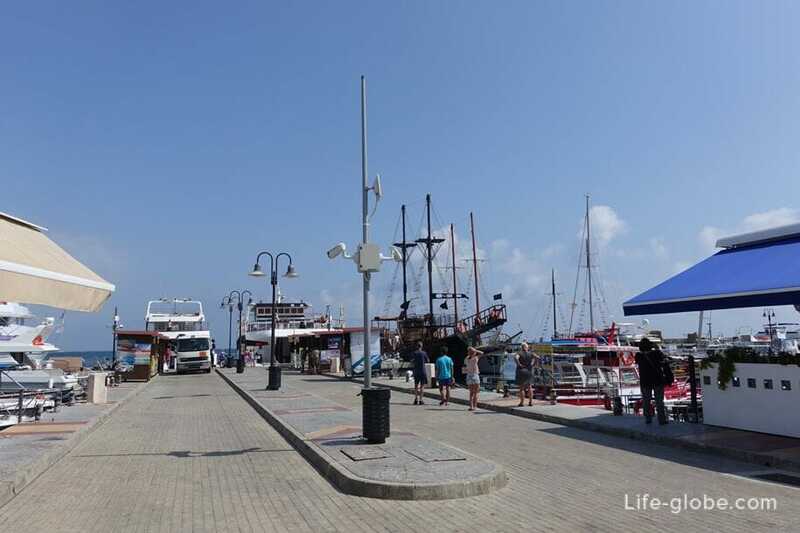 The length of the waterfront of Kato Paphos together with Paphos promenade is about 6 kilometers, while the length of the waterfront of Paphos is about 5 kilometers. 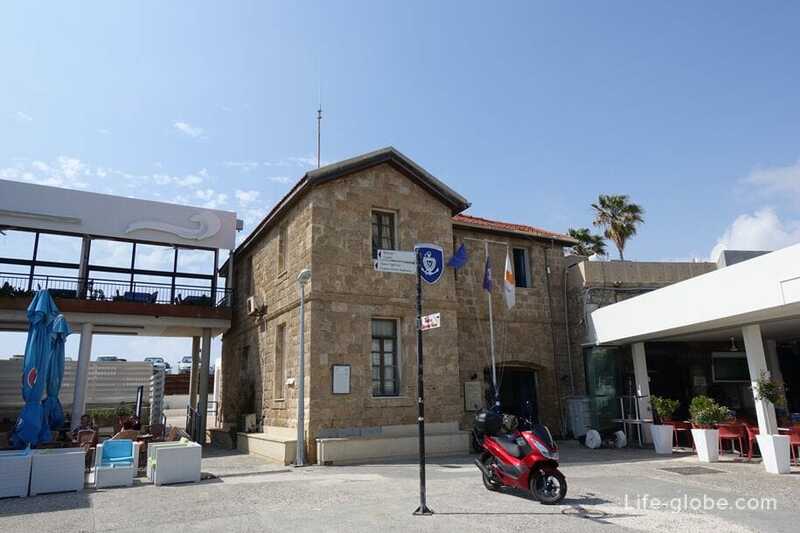 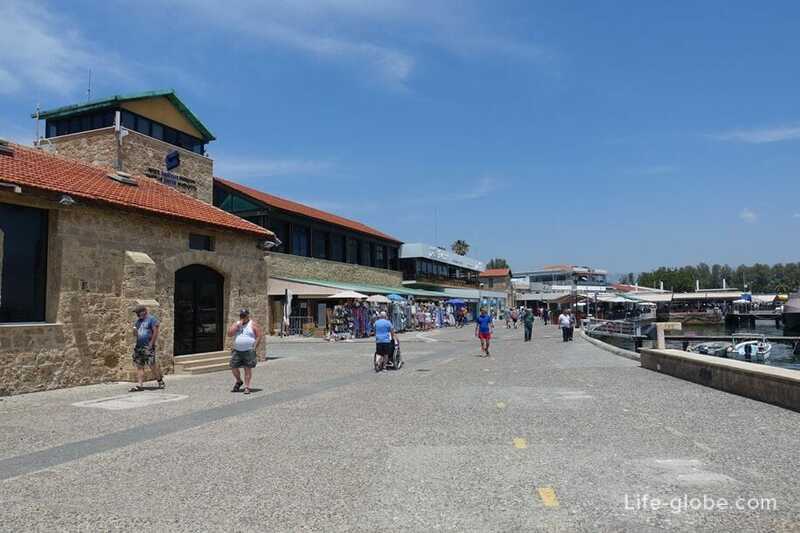 The most active and developed part of the waterfront of Paphos originates from Paphos Castle, runs along the Harbor and stretches to the "Municipal Baths" (Municipal Baths Beach). 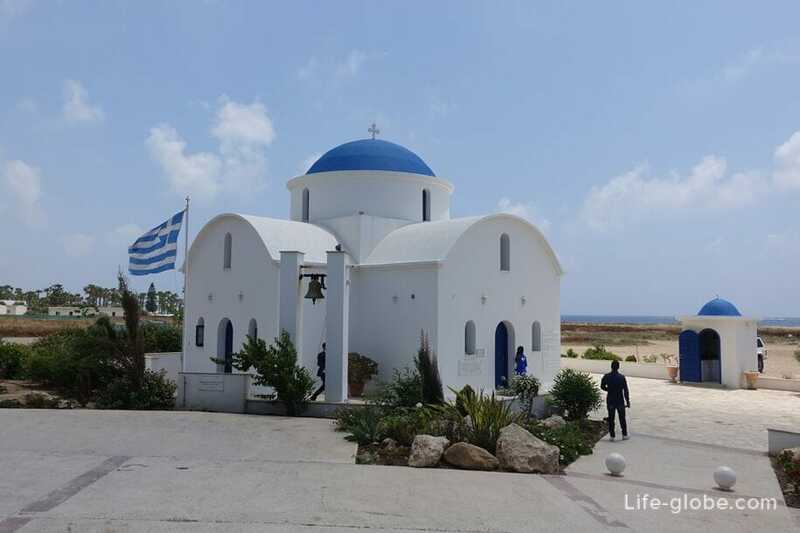 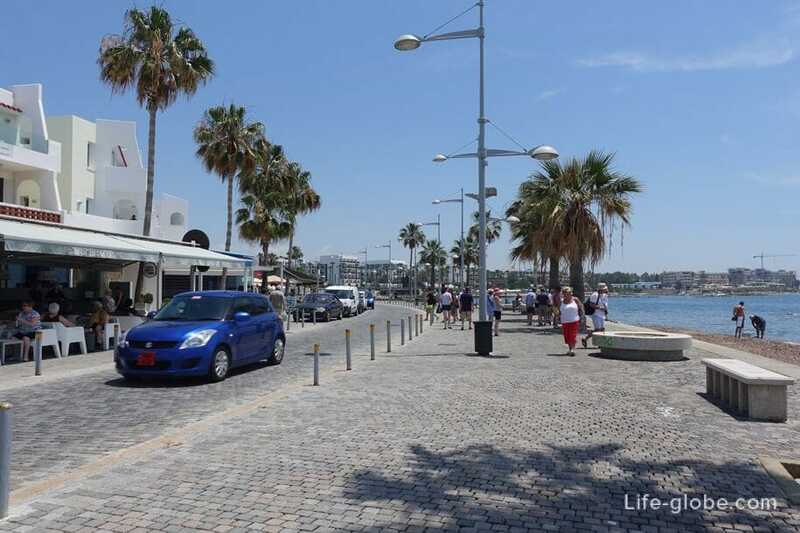 Consists of streets Apostolou Pavlou Avenue and Poseidonos Avenue. 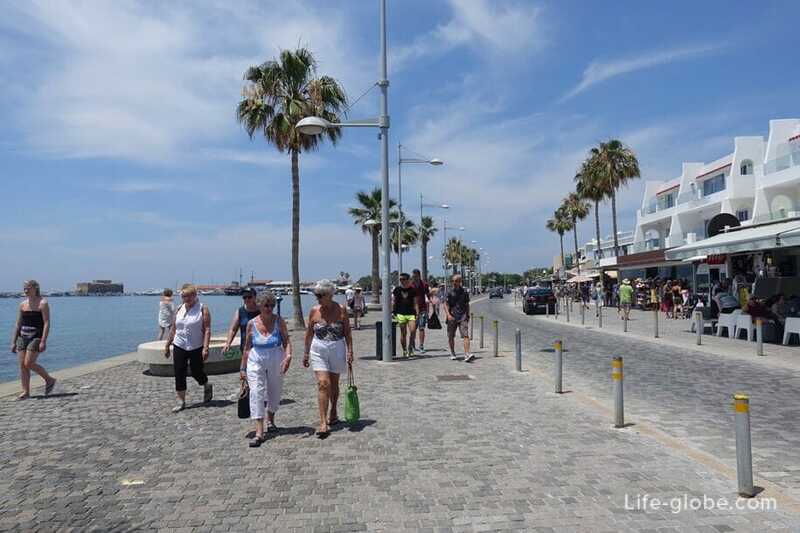 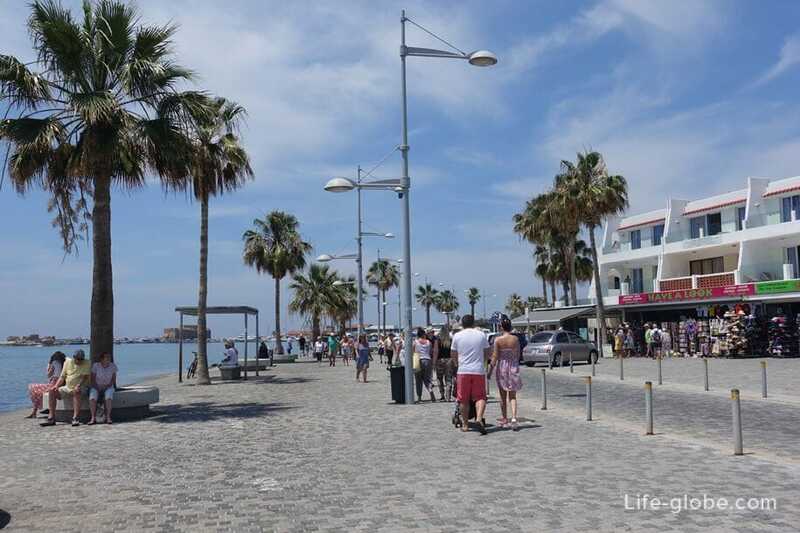 This length of the promenade has a length of 1 kilometer and is popularly referred to as the main or Central promenade of Paphos. 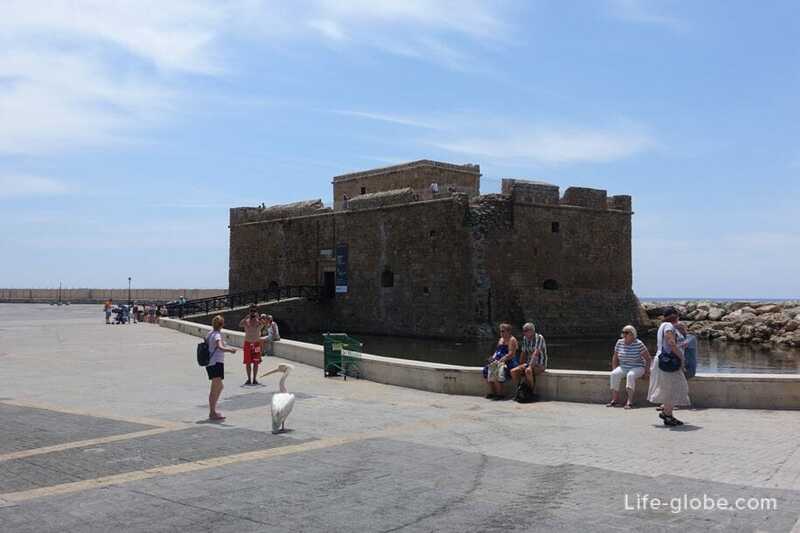 On the right side of the castle you can see the sculpture "Modern Aphrodite", a girl-goddess climbing onto a large stone and looking towards the Harbor.. 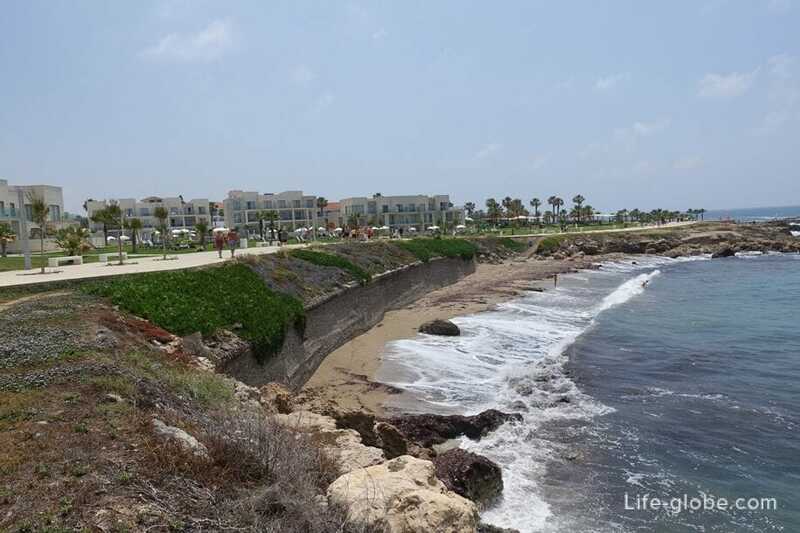 Behind the castle, at 1.8 kilometers wild part of the coast along which runs the most quiet part of Paphos harbour area. 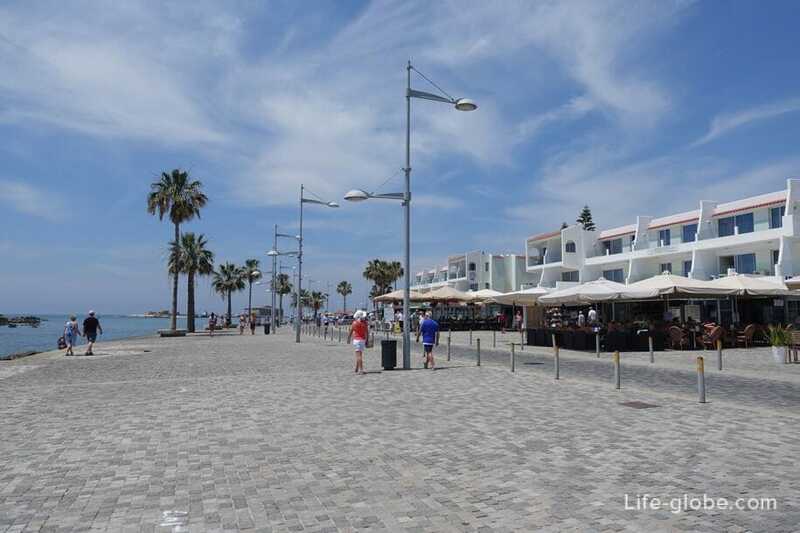 The promenade skirts the coast, runs along the fence, which is Paphos Archaeological Park (entrance to the Park from the Central waterfront), and outputs to the beach of Faros or lighthouse (Faros Beach or Lighthouse Beach). 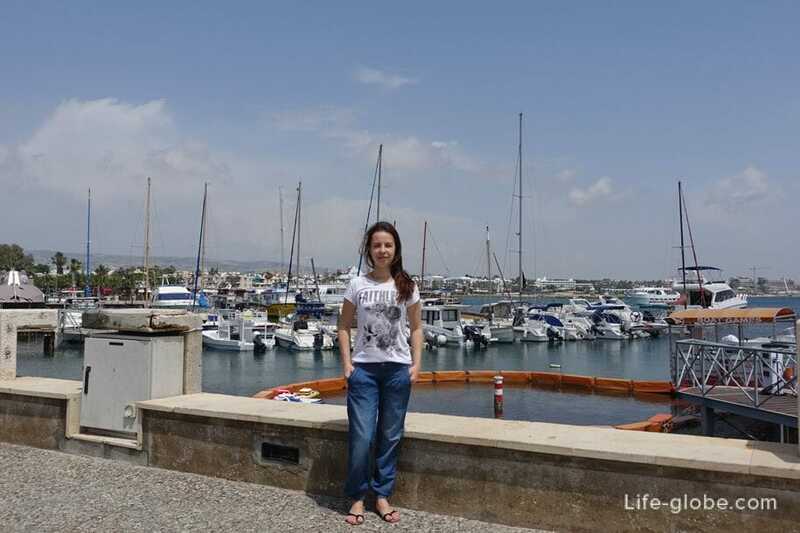 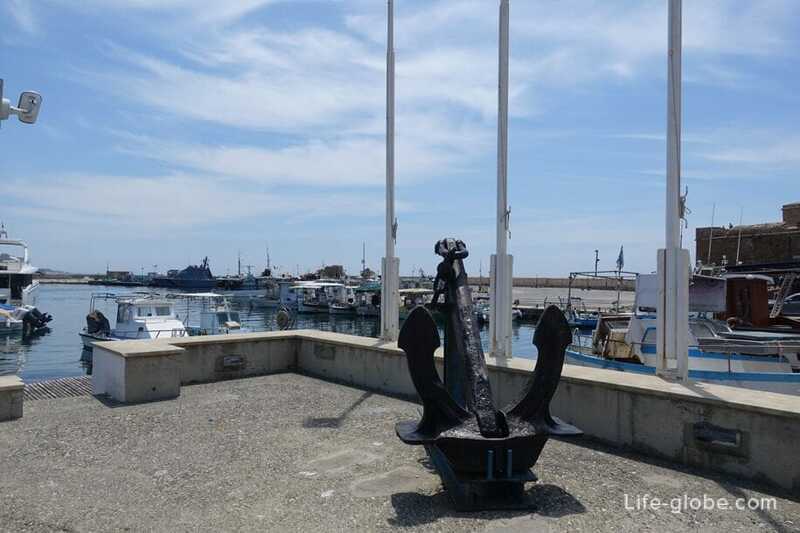 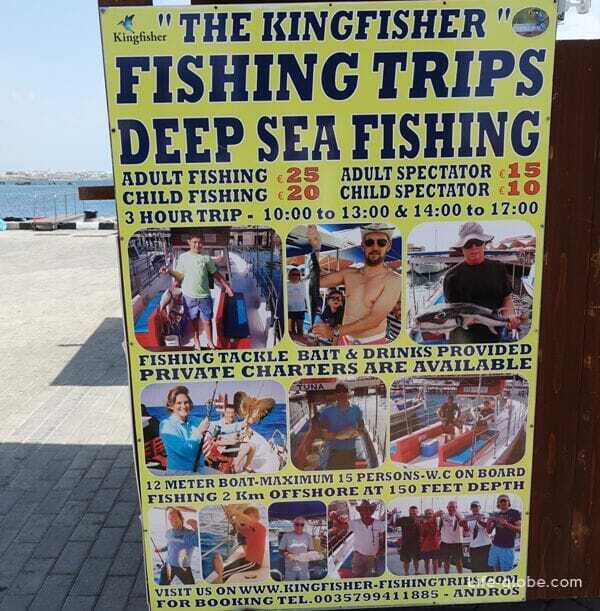 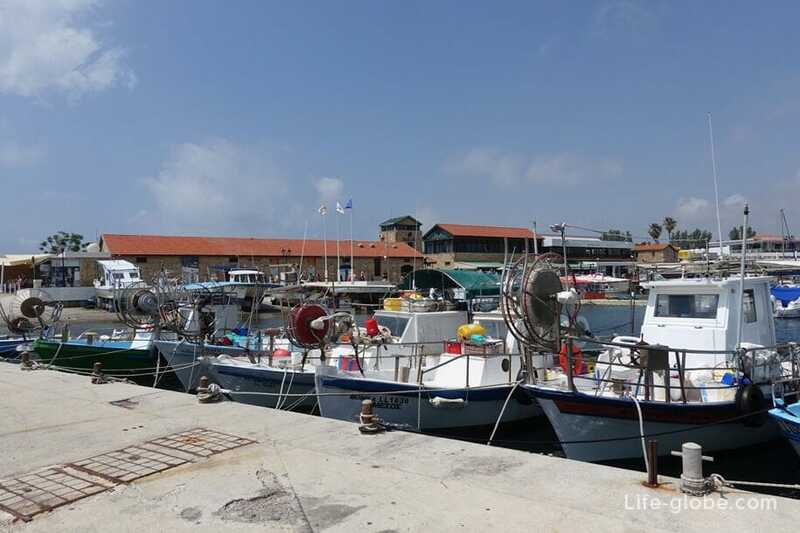 Near Paphos Castle lies the old fishing harbour, in which: a small colorful fishing boats, yachts and pleasure catamarans, where you can take a boat trip along the coast or out to sea. 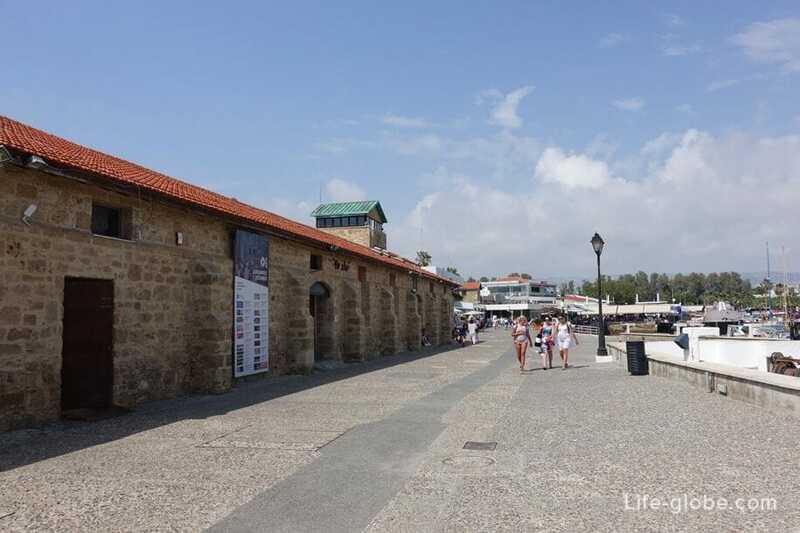 Near the castle, the old town port is the En Plo gallery. 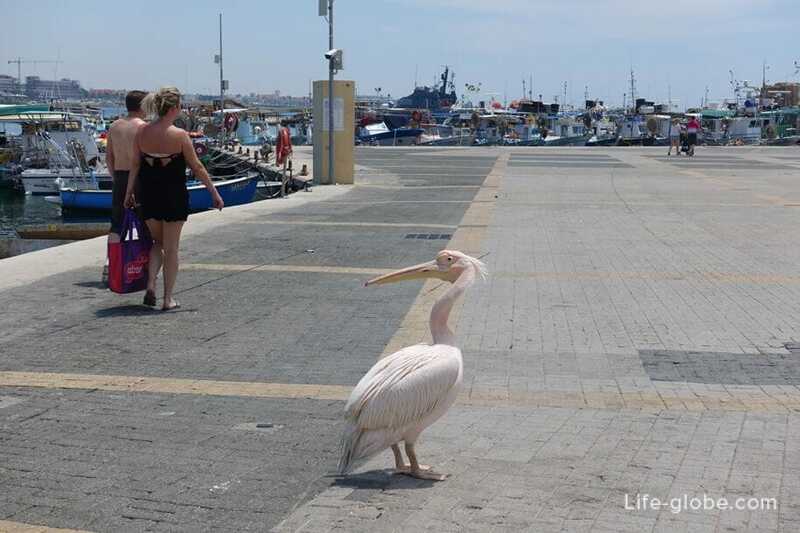 Impressively walks the pink Pelican, and the guests, take pictures with him, trying to come as close as possible, but still wary and too close not suitable. 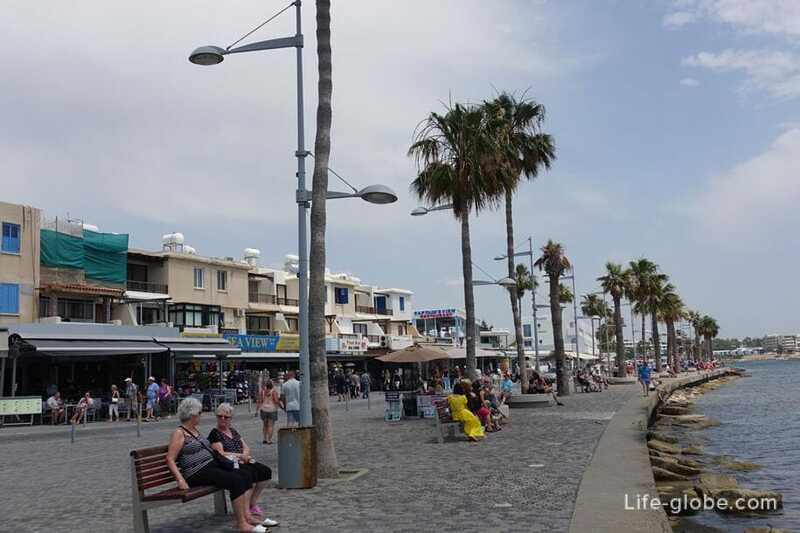 On both sides of the promenade along the harbour, plenty of cafes and restaurants, latkes with ice cream and refreshments, stalls with Souvenirs and beach paraphernalia. 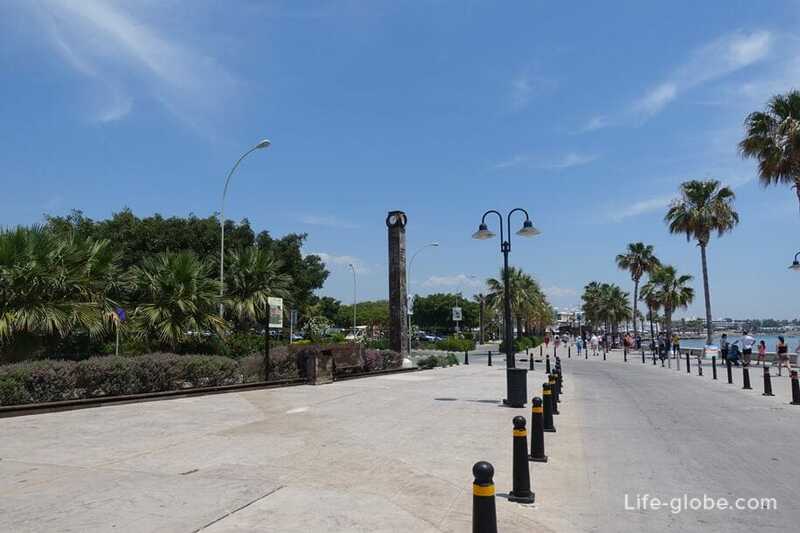 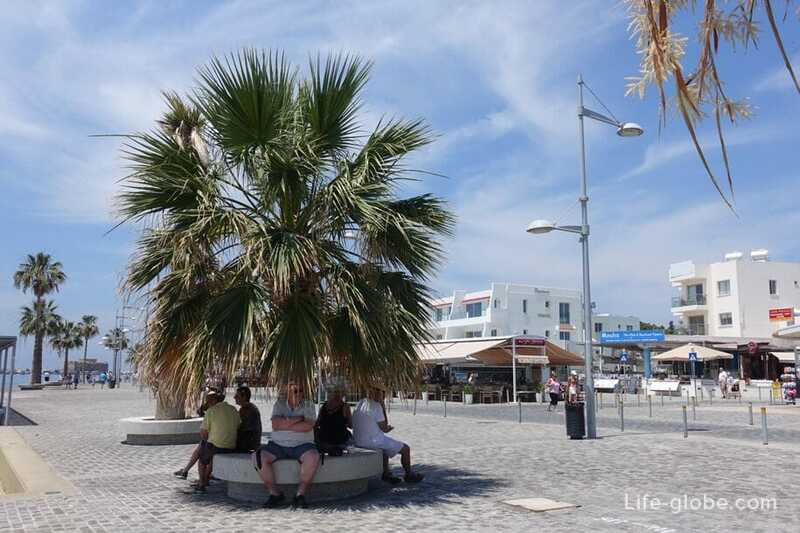 Next originates Poseidon Avenue is the widest part of the promenade, with palm trees and Seating, with views of the Bay and the harbour. 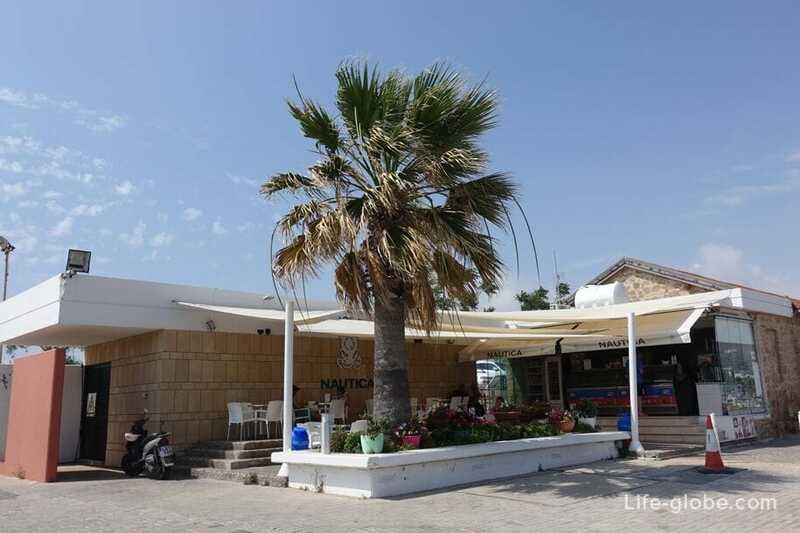 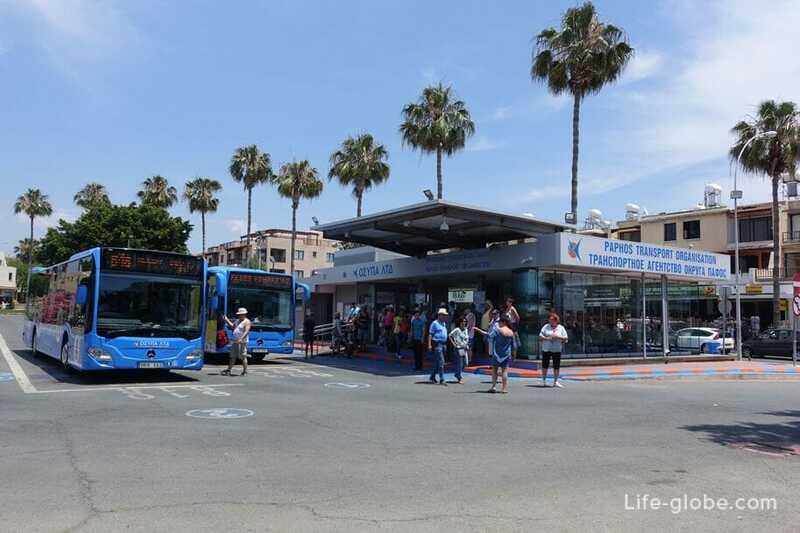 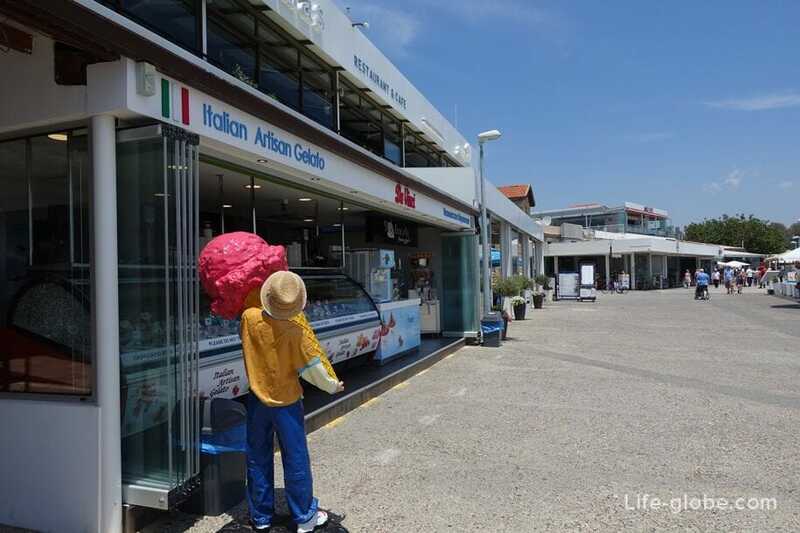 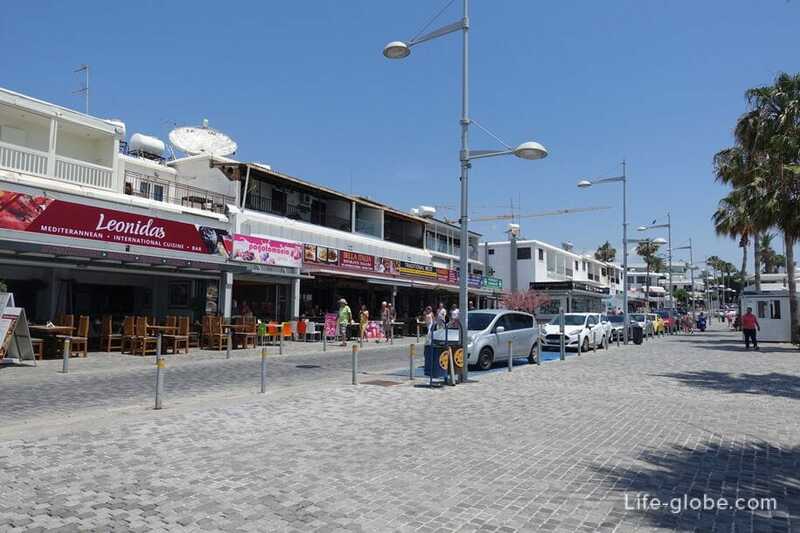 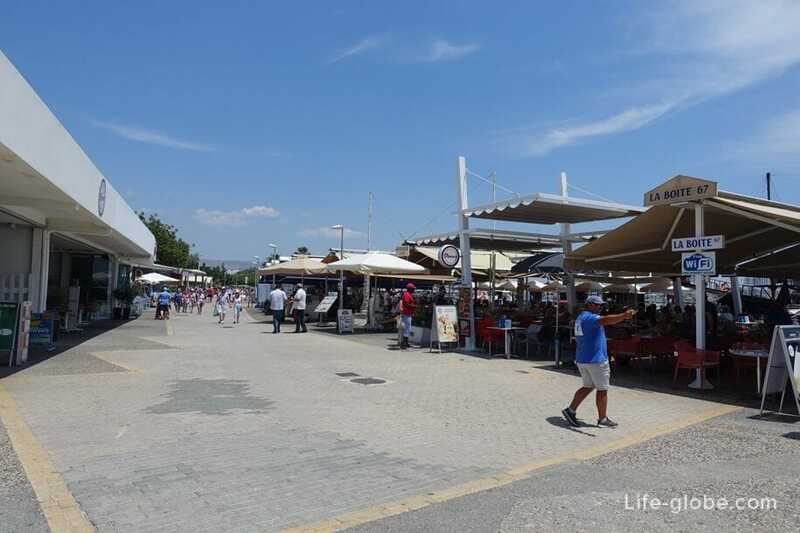 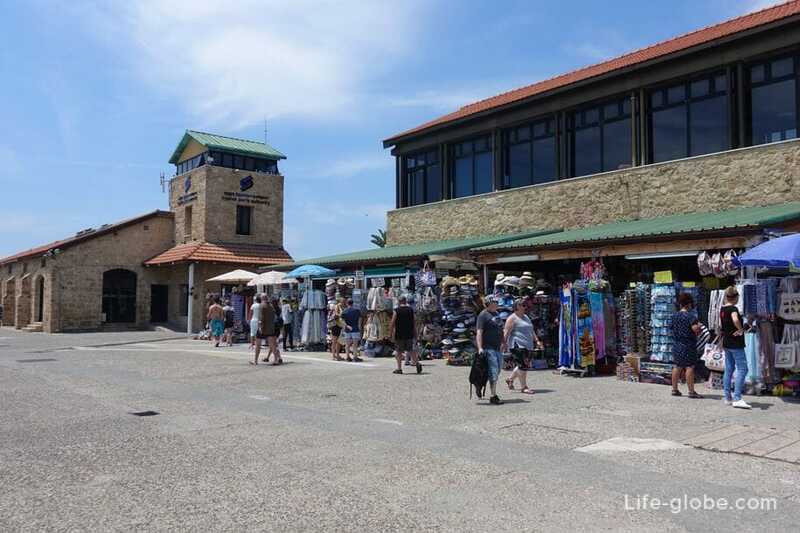 In the center of the promenade of Poseidon is passing a narrow one-way street, where cafes and souvenir shops. 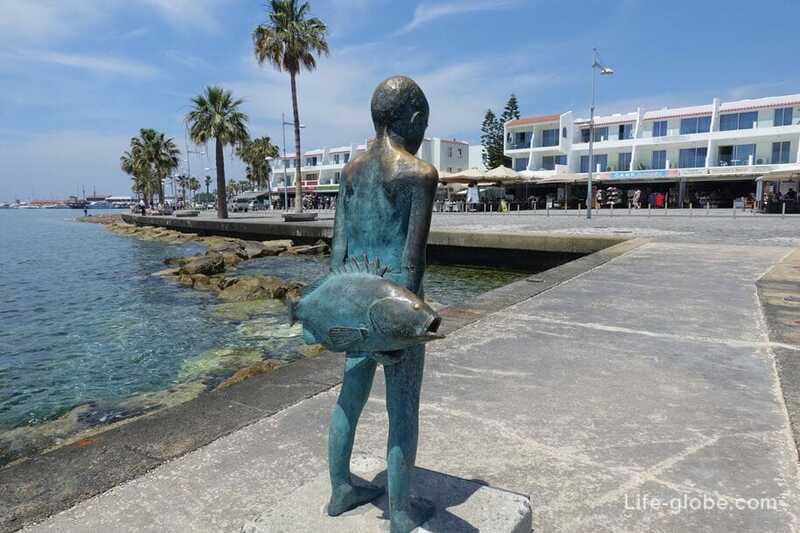 The sculpture "Boy with fish". 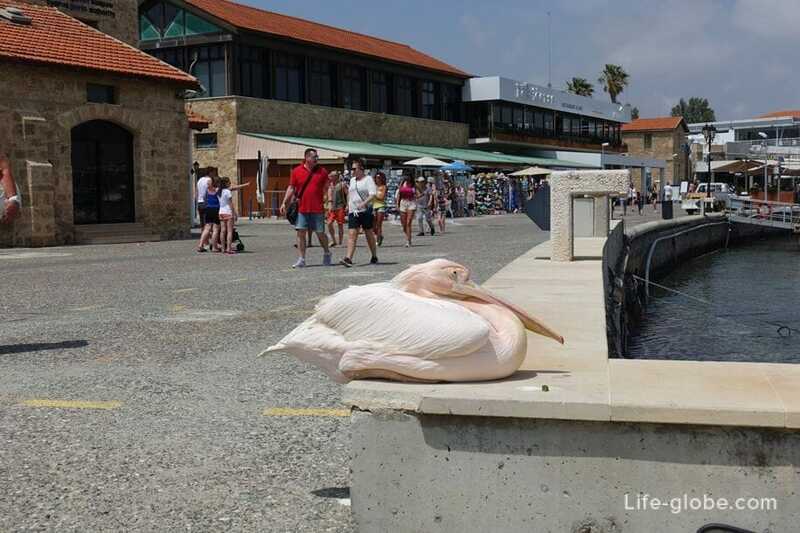 It seems nothing special, but still attracts attention. 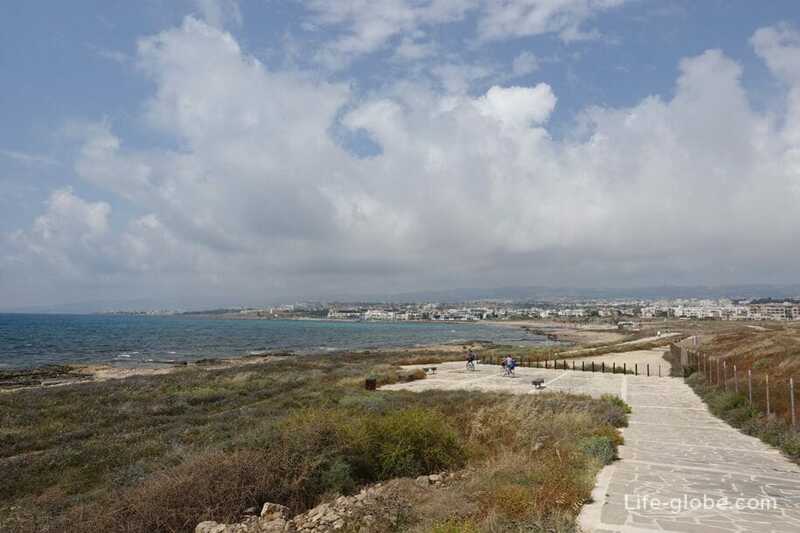 From the Municipal Baths and to Geroskipou, along the coast stretches a promenade - Coastal Broadwalk. 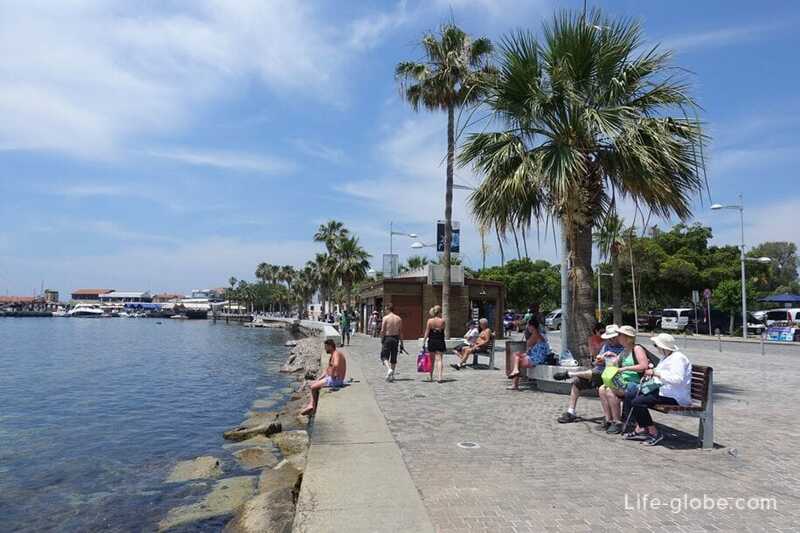 In our opinion, this is the most scenic part of the waterfront. 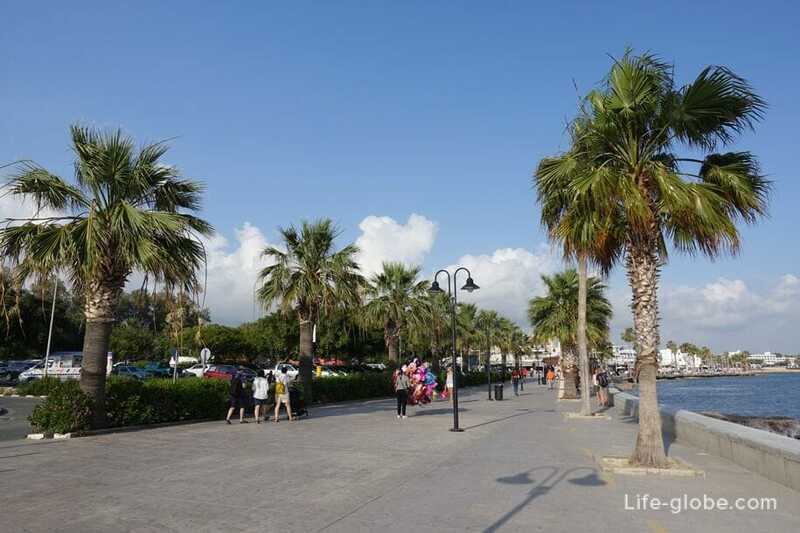 It is here that the waterfront is a narrow landscaped path, near which there is an abundance of cafes and restaurants, close not goes transport, and part of the coastal beach strip lies below the level of the embankment, under a small cliff, which makes this place very picturesque and inviting to leisurely walks along the sea. 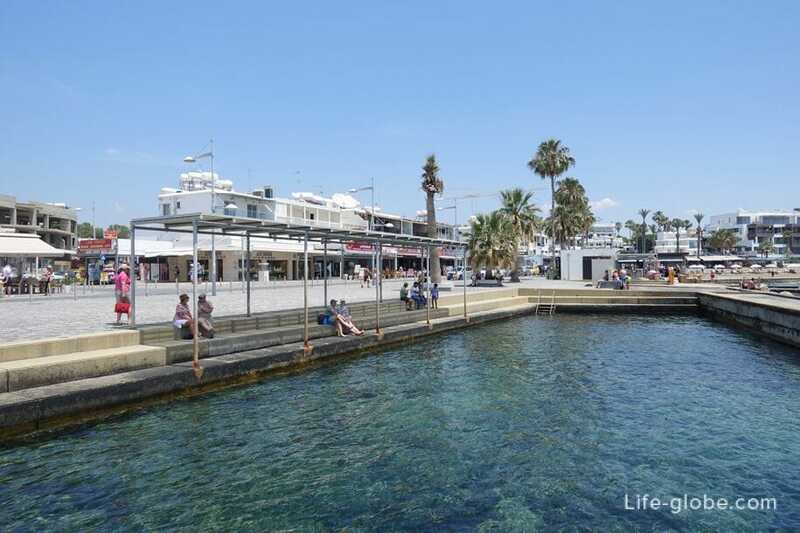 Promenade Paphos or Yeroskipou (Geroskipou) stretches along the sea for about a colimeters. 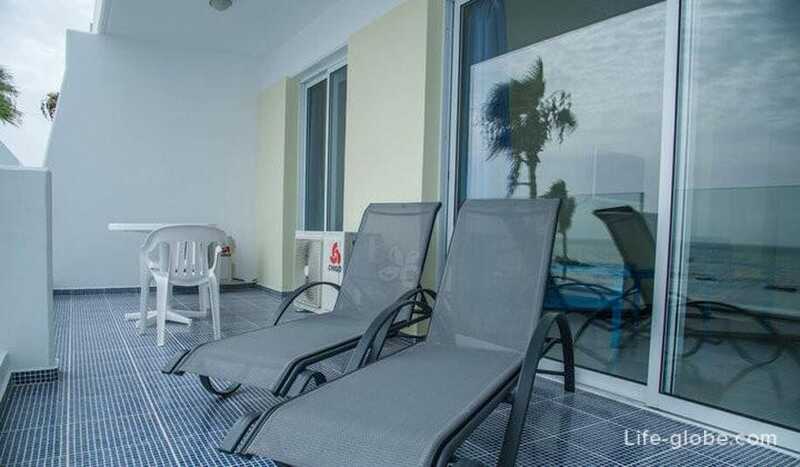 - Seaside Luxury Apartment Lighthouse 47 with a balcony, air conditioning, free Wi-Fi and a flat-screen TV. 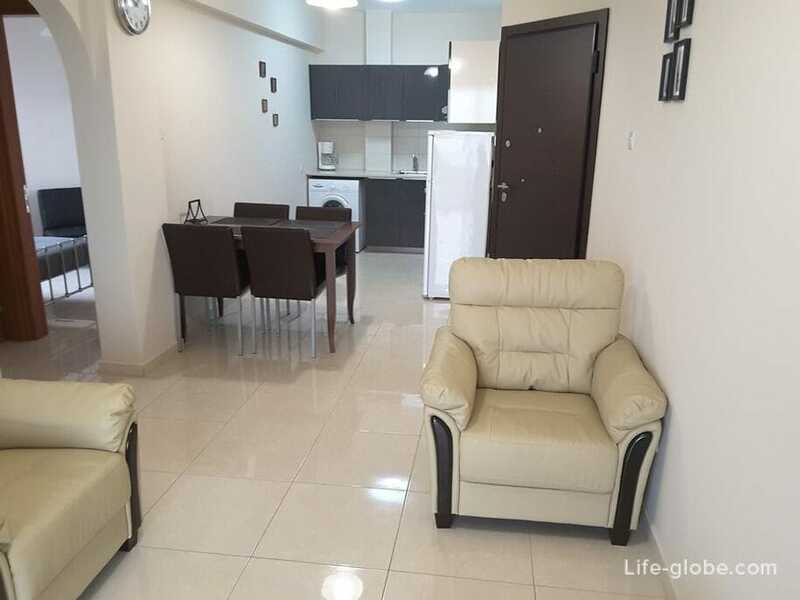 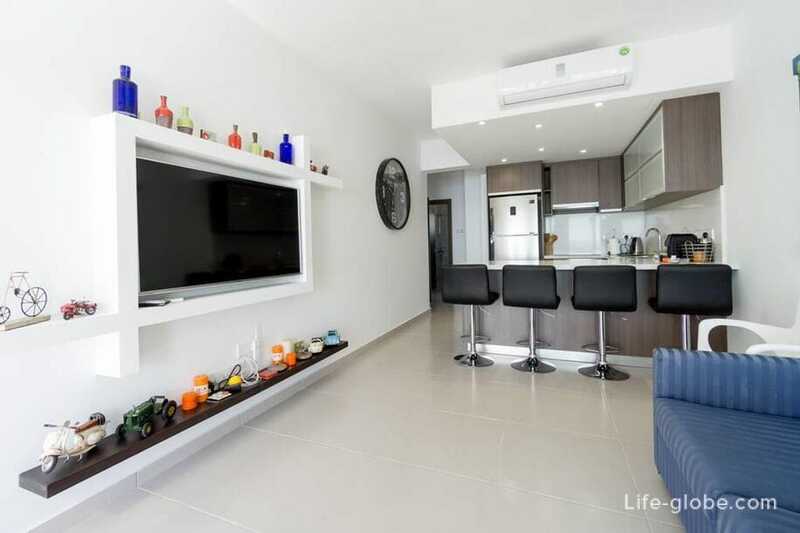 The apartment consists of 2 bedrooms, a living room, a fully equipped kitchen with an oven and a bathroom. 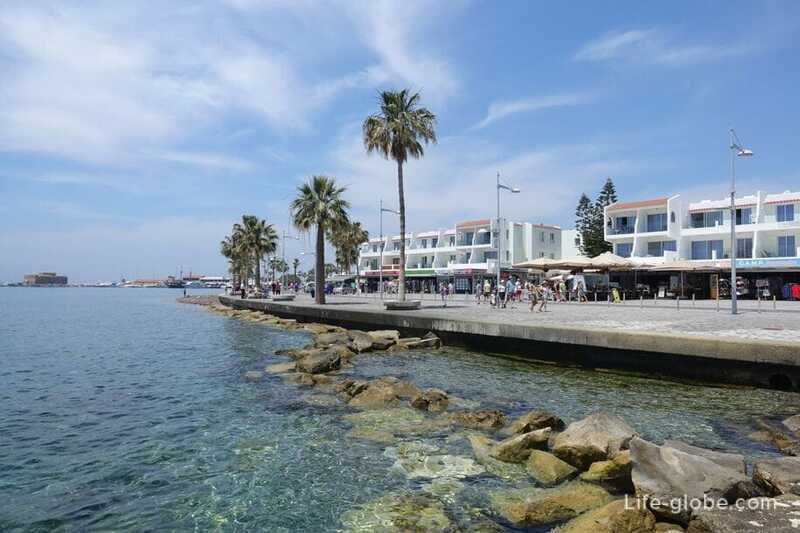 - Meltemi Holiday Apartments with free Wi-Fi, a balcony with sea views and a kitchen with a microwave and a toaster. 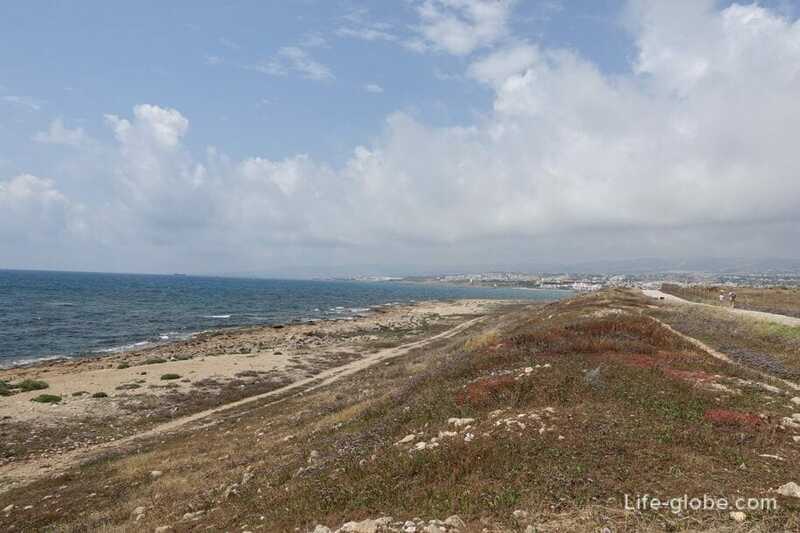 - Apartment complex Paphinia Sea View, consisting of apartments and studios with a private kitchen and a balcony. 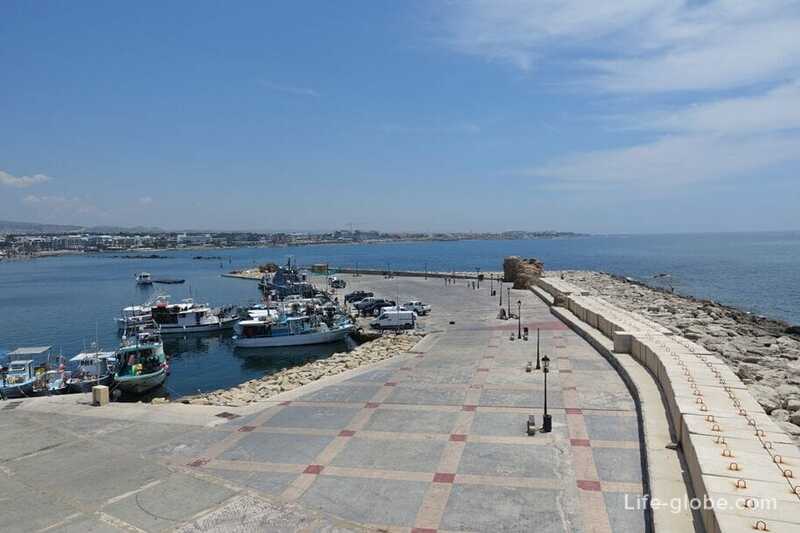 - Seaside Luxury Flat: 53 Lighthouse with sea view, bar and balcony. 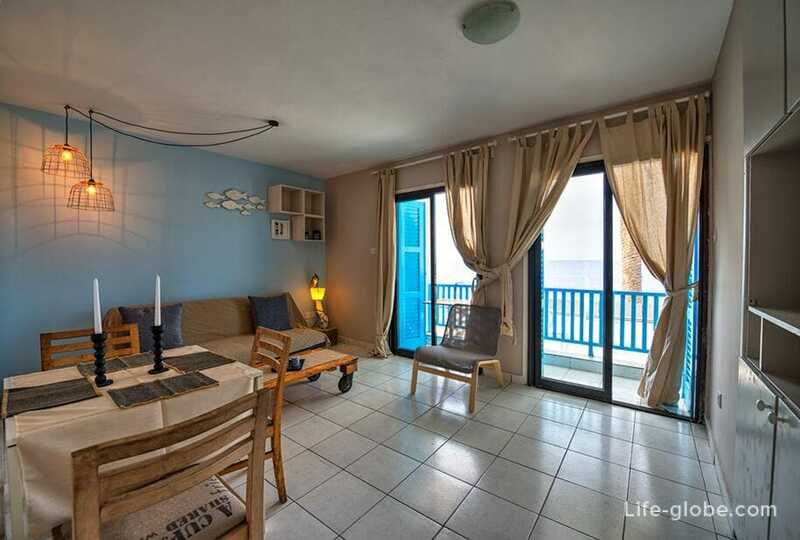 Amenities include: air conditioning, fully equipped kitchen, a dining area and a flat-screen TV. 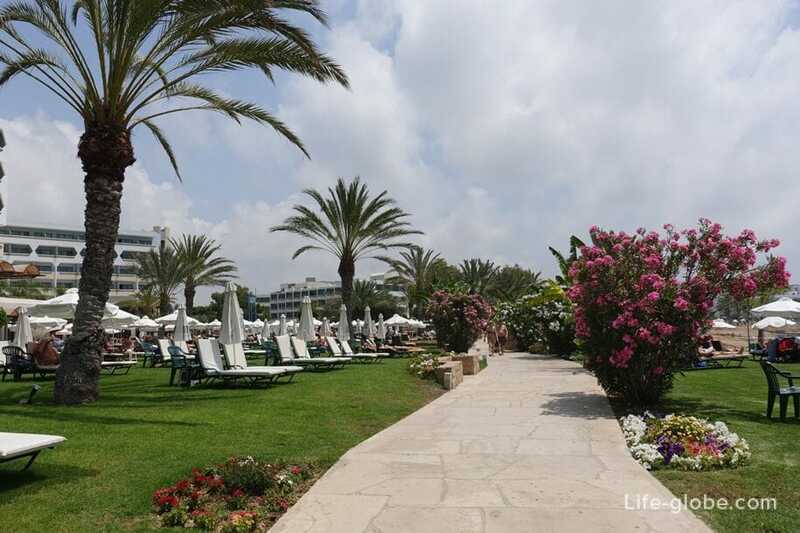 - 5-star resort Annabelle Hotel with tropical landscaped gardens surrounding a large pool with artificial grottoes. 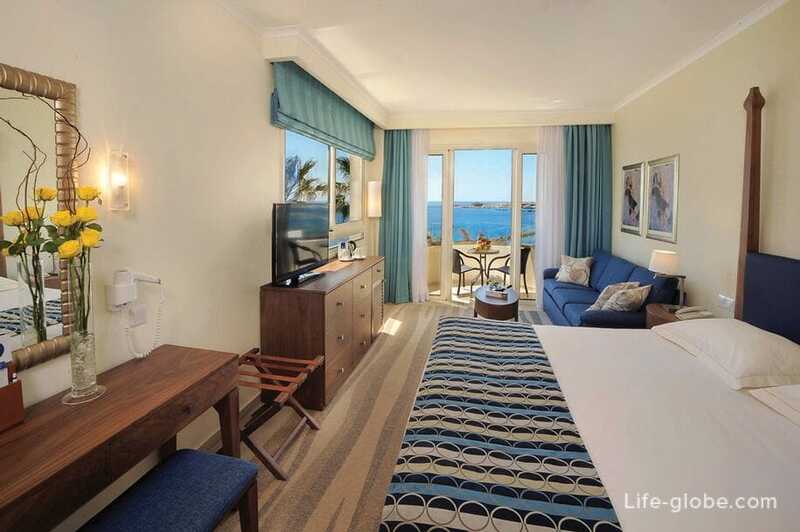 Each room has a Minibar and satellite TV and free Wi-Fi. 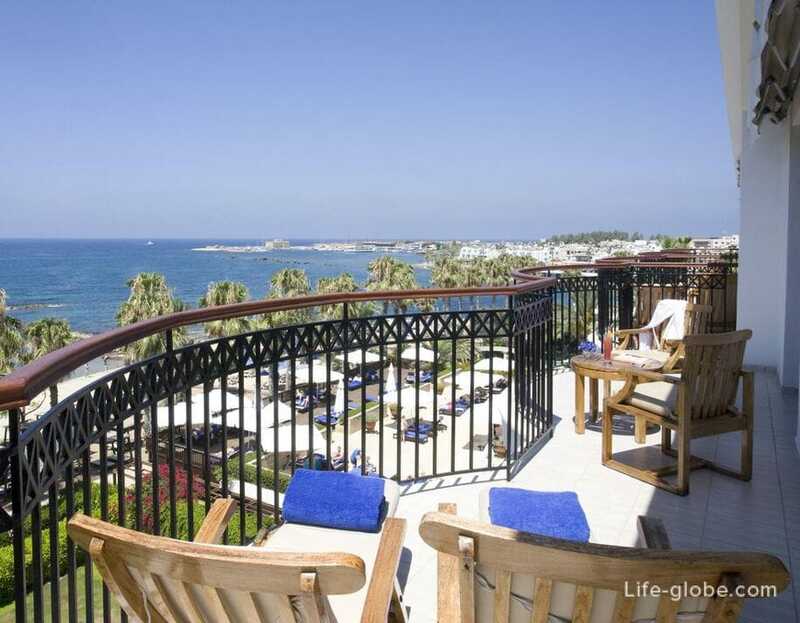 - 5-star hotel Almyra located in the tropical gardens overlooking the Mediterranean sea. 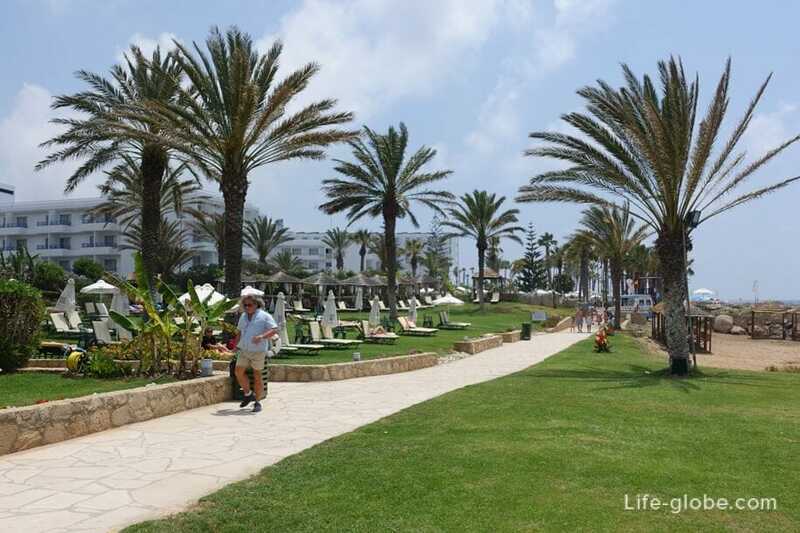 It offers rooms with free Wi-Fi, 4 freshwater pools and a Spa. 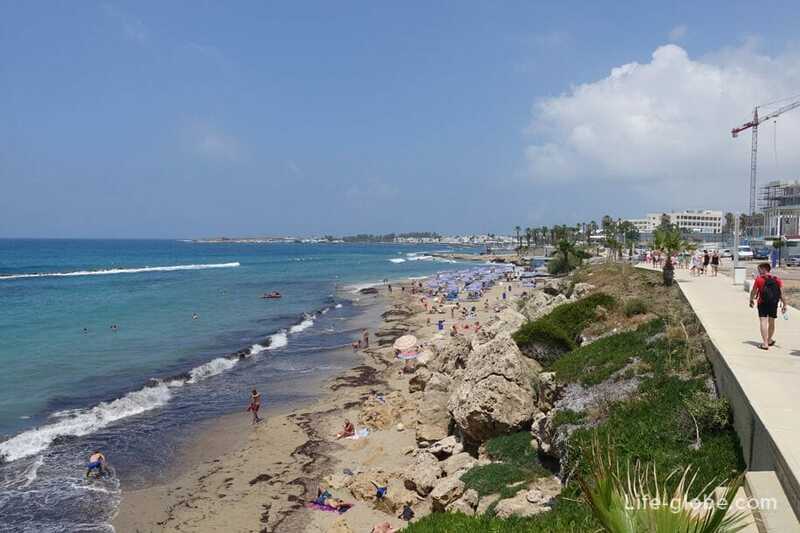 The rooms have air conditioning, French Windows and a balcony or terrace with views of the garden or the Mediterranean sea, a Minibar and a safety Deposit box. 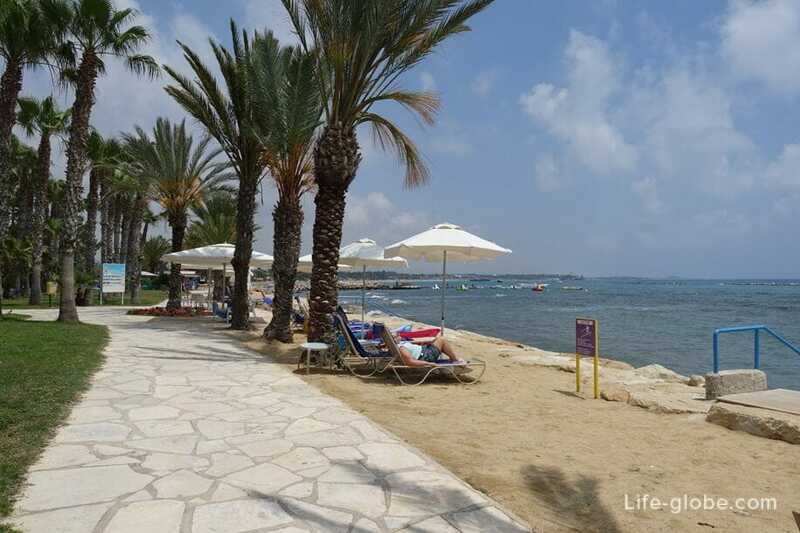 - The 4-star Alexander The Great Beach. 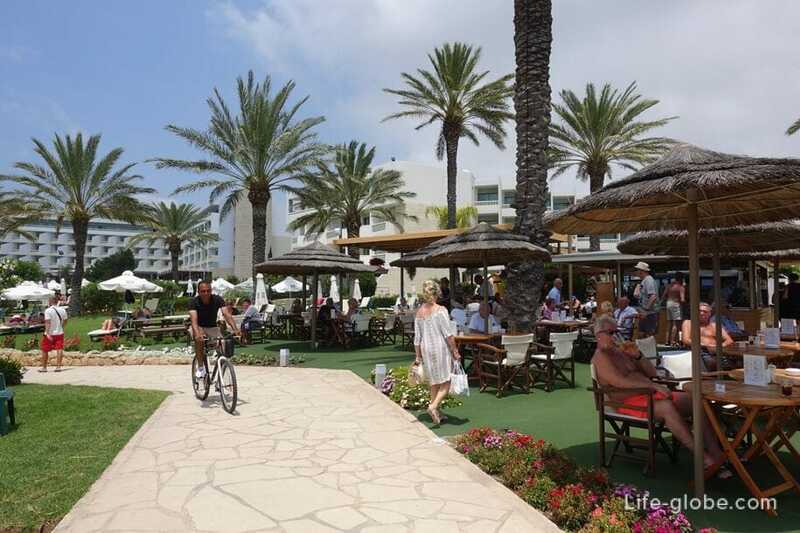 It offers a restaurant, 2 pools and air-conditioned rooms. 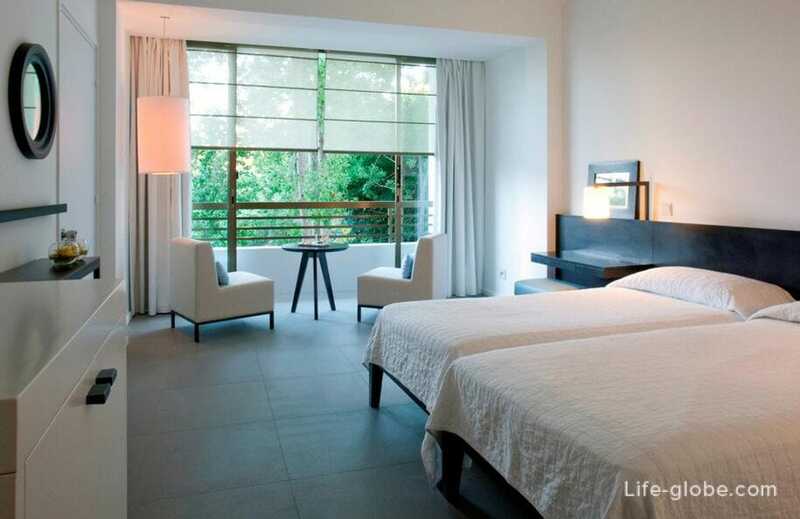 Rooms include a coffee maker and a Minibar. 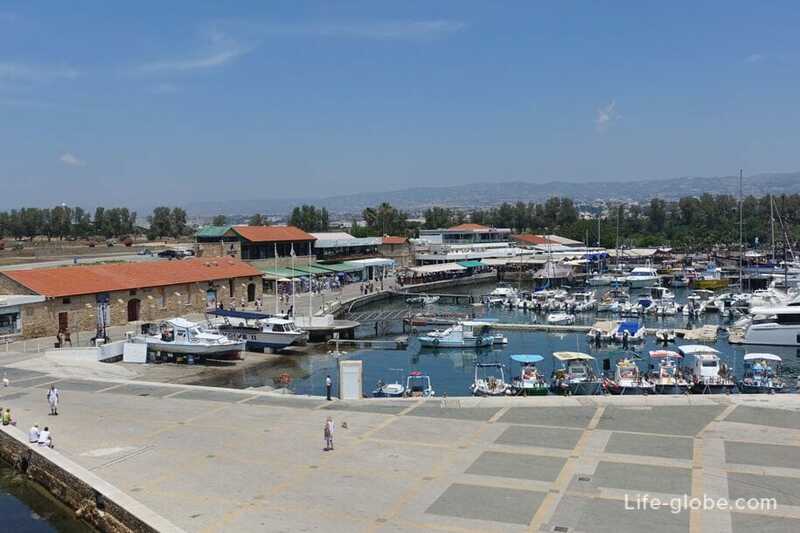 Some rooms have a balcony with views of the sea, the medieval castle and the old fishing harbour of Paphos. 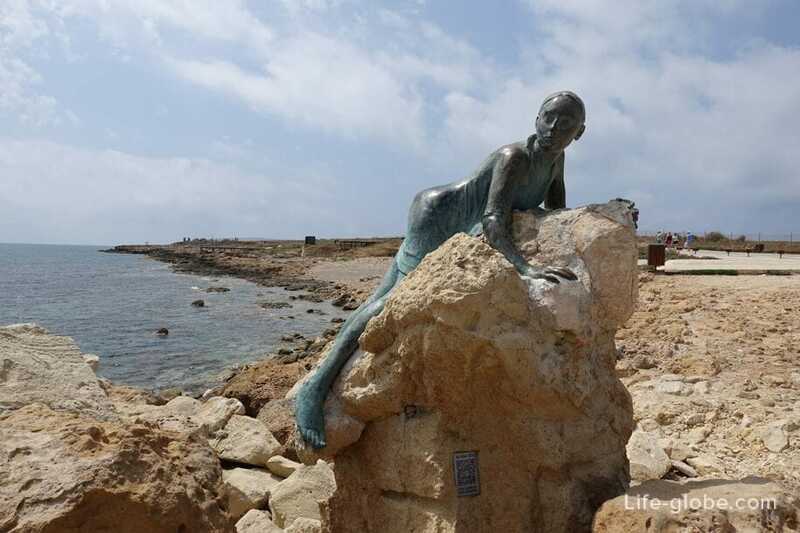 - 631 (Rock of Aphrodite, Kouklia Harbour). 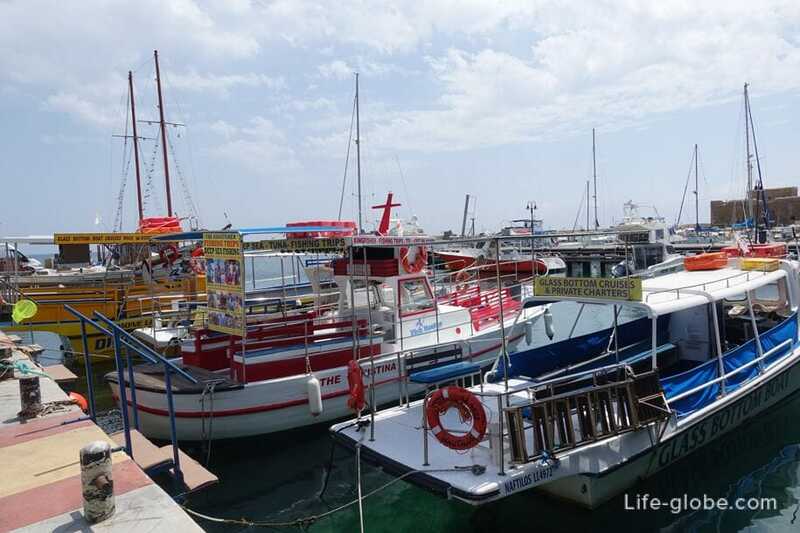 Can also be reached by taxi or rental car.